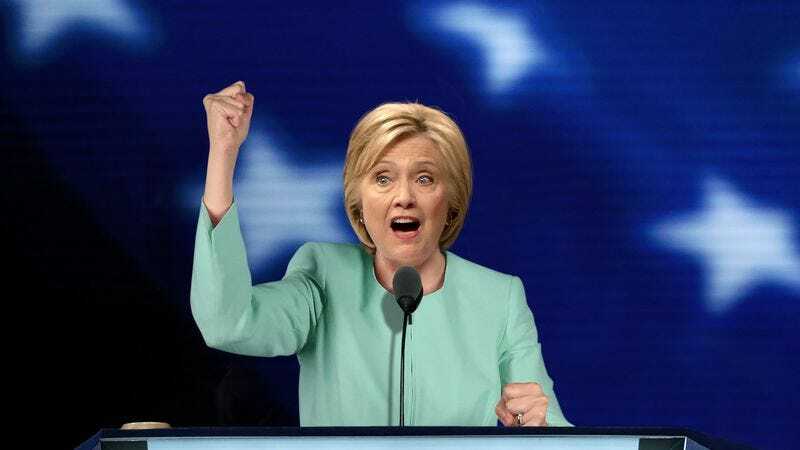 PHILADELPHIA—In a stirring, heartfelt address Thursday night at the Democratic National Convention in which she laid out her vision for the future of the United States, presidential nominee Hillary Clinton stated that every young girl in the country deserved “an equal opportunity to one day feel raw, unbridled power coursing through her body.” “I want to live in an America where every single girl has the chance to feel that the entire world is her puppet to command and to become intoxicated by the overwhelming euphoria that comes with knowing she can crush anyone, anywhere, at any time,” said Clinton, her voice growing louder and more emphatic as she suggested that Americans needed to do more to close the gender gap and ensure that female youths from all walks of life could pursue futures in which they’re continuously possessed by a rapturous bliss from wielding sweeping authority constrained by no legal or moral bounds. “My dream is that someday soon, it will not seem at all out of the ordinary for my granddaughter to literally quake with exhilaration from holding dominion over millions of people who have no choice but to comply with her every word. I will do everything I can to make sure that she, and every young girl like her, grows up in a nation that places no restrictions on her opportunities to feel total, limitless power pumping through her every vein.” Clinton concluded by listing several policy proposals that she hoped would help spark an unquenchable fire for control deep inside young girls’ very cores and set them on a path to eventually basking in the warm, all-consuming glow of possessing unchecked supremacy.